Looking north from the beach. Just 70 minutes south of New York on the Jersey Shore, Asbury Park is undergoing a renaissance of culture and real estate development. 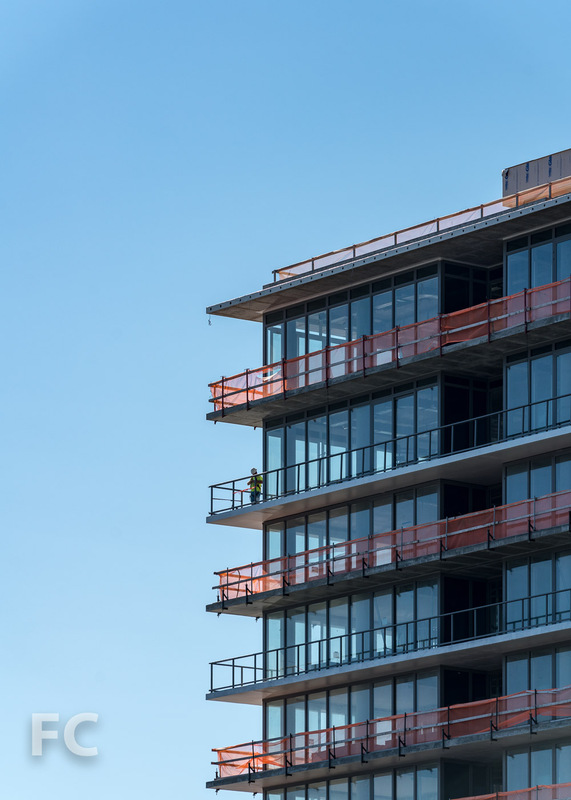 Adding to the recent boom in live music and restaurants, a new hotel and residential condo development from iStar is under construction at the oceanfront. The Asbury Ocean Club is part of iStar’s 10-year, multi-billion-dollar redevelopment plan for the Asbury Park oceanfront which includes the Asbury Hotel, a bowling alley and music venue at Asbury Lanes, and Monroe’s 34 condo homes. Southeast corner from the beach. 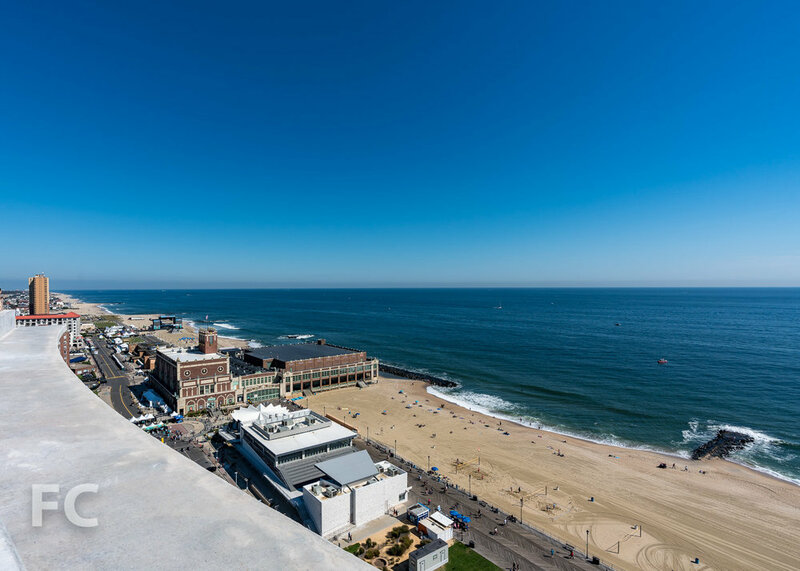 The 17-story Asbury Ocean Club is designed by Handel Architects and occupies an oceanfront site at Ocean Avenue, between 3rd Avenue and 4th Avenue. A 54-room boutique hotel will anchor the four story podium, with the condo residences in a tower on the north half of the site. Northwest corner from the Asbury Hotel. Closeup of the northeast corner of the tower. Southeast corner from Ocean Avenue. Looking up at the east facade from Ocean Avenue. Residences will range from one to three bedrooms, each with ocean view outdoor terraces. Interiors feature floor-to-ceiling glass and a light palette including bleached white oak engineered hardwood flooring, white lacquered custom kitchen cabinetry by Spazzi of Spain, and polished porcelain Marvel Calacatta bathroom walls. Hotel guests and residents will share indoor-outdoor amenity spaces on the fourth floor which will include a terrace and pool, pool bar and grill, a garden pavilion, and an outdoor lounge. Other amenities will include an ocean view fitness center programmed by the Wright Fit, a yoga room with meditation terrace, spa, children’s facilities, entertainment and meeting spaces, a 17-seat cinema screening room, library and game room, event room, and storage rooms. A private members-only beach club with pool, cabanas, bar and grill, restrooms, and changing facilities will be built nearby and open in 2020. Two penthouses will include rooftop terraces with outdoor kitchens and living and dining spaces. Looking south from the penthouse rooftop terrace. Looking north from the penthouse rooftop terrace. Architect: Handel Architects; Creative Lead/Design Director: Anda Andrei Design; Garden Designer: Madison Cox; Landscape Architect: Melillo + Bauer Associates; Developer: iStar; Program: Hotel, Residential Condo; Location: Asbury Park, New Jersey; Completion: 2019.